This year the GCS Green Team is focusing on eWaste. Did you know that while eWaste makes up only 2% of landfill waste, it makes up 70% of toxic waste found in landfills? 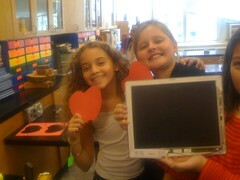 Watch out around school for tips and ideas about how to reduce eWaste, recycle better, and make our gadgets greener! This entry was posted on November 15, 2009 at 9:32 pm and is filed under Community, eWaste, Recycling. You can subscribe via RSS 2.0 feed to this post's comments. You can comment below, or link to this permanent URL from your own site.